What makes Tubecast different from other is the ability to cast the videos to a range of services like DLNA devices, Chromecast and AppleTV. You can try casting free for 20 times, if you like it you can unlock it by making in-app purchase. Tubecast is my favorite of all and you should seriously consider giving it a shot if you use YouTube often. It is available as a free download for both phones and PCs. Similar multitasking capabilities available in Explorer for YouTube. As the name suggests, this app is another full featured YouTube client for Windows 10.The interface is clean and inline with Windows 10 guidelines. It allows you to login into YouTube and has the capability of downloading videos for later use. You can select where the downloaded videos are stored. You can also define the default quality for all the videos. However, the app is ad-supported ( non intrusive though) and can only download upto 720p in the free version. An in-app purchase will remove ads and limitations completely. This app is a universal one and built for Windows 10. 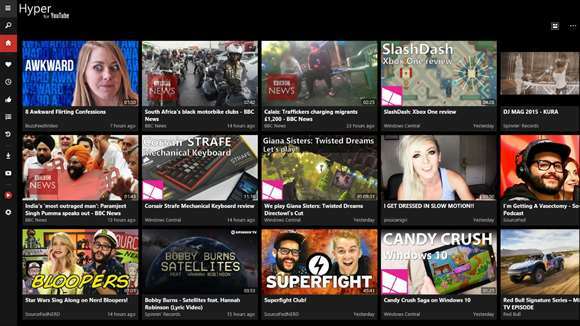 Hyper for YouTube is one of the highest rated clients in Windows Store and is chock full of features. The interface is good and very much customizable. Similar to Explorer for YouTube, this app supports video downloading and background playback. Again you will have to make an in-app purchase to unlock pro features. For the most part, app feels stable and fast. The only drawback is that the app is available in PC only which might turn off some people if they prefer to have a universal app across their devices. It's worth checking out if you are a avid PC user in search of a modern and clean YouTube app. One more notable app is Metrotube which used to be a rather popular app but lack of updates has made that app feel dated. Do you prefer to use apps to access YouTube ? Which app do you use then?